Today’s Bacon Month recipe is sponsored by Torani and their amazing line of products! Thank you for supporting the sponsors who support A Simple Pantry! 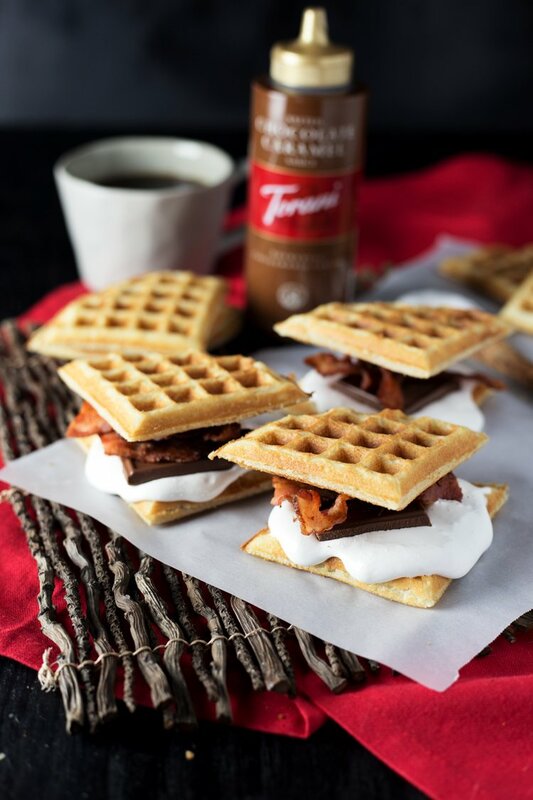 I must admit, these Bacon Waffle Smores were inspired by the ones I demo’ed at World Market. Those used dark chocolate laceys and bacon chocolate, but they were so delish. We’re talking the perfect marriage of sweet and salty. These bad boys were so amazing that my sugar-free dad (by choice!) ate not one, but TWO full smores. It’s bizarro land here, folks. 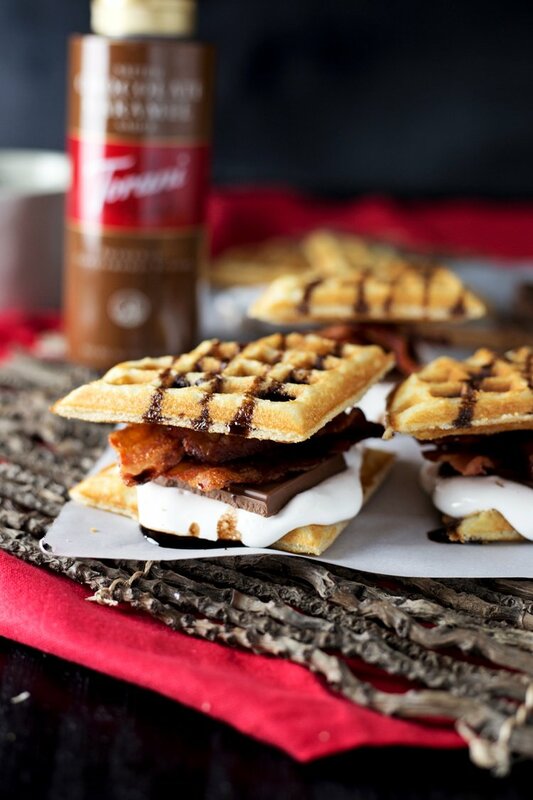 But in all seriousness, these bacon waffle smores were so easy to make. You can basically use your favorite waffle/pancake mix if you’re feeling a little lazy like I was. I just moved cross-country, please don’t hate me. 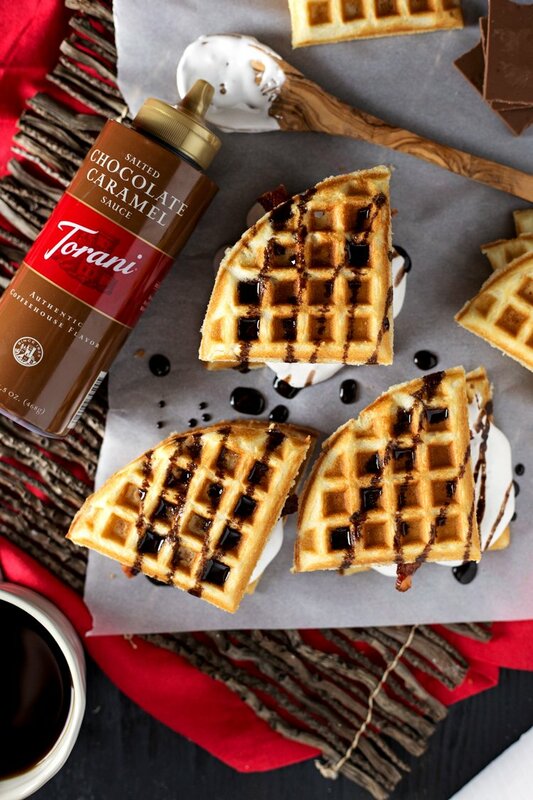 But what really makes this recipe tops is the Salted Caramel Chocolate Sauce from Torani. It adds that liquid syrup aspect that is crucial to anything having to do with a waffle or pancake. Dry waffles are so gross. So gross. I also went with my fave marshmallow fluff instead of a fire-charred marshmallow, to make it more indoors-convenient. The drippy gooeyness is totally tops. But of course, once you add the chocolate and the salty strips of crispy bacon?!? It is on like Donkey Kong, my friends. Since it’s the last day of our illustrious Bacon Month, everyone has participated with an appropriately bacon-y recipe, so please do check them out! || Skillet Breakfast Potatoes & Bacon from Kleinworth & Co.
It’s also your last chance to enter our many giveaways, so if you haven’t yet, go! Now! 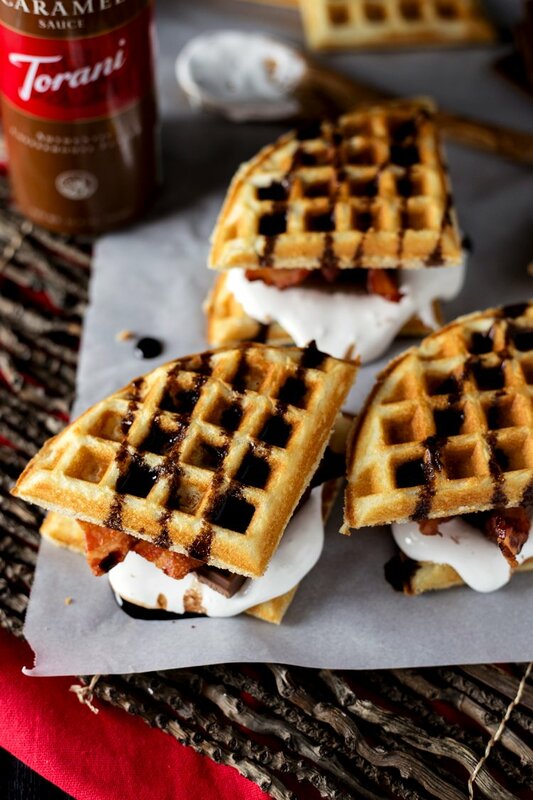 And enjoy some bacon waffle smores while you’re at it! Cut each waffle into equal quarters and set 4 quarters to the side. Divide the marshmallow fluff between 4 of the waffle quarters (2 tablespoons per quarter), and spread to the edges. Top each with a single square of chocolate, followed by 2 slices of bacon each. Top with the remaining waffle quarters and drizzle with the salted caramel chocolate sauce. Serve immediately.